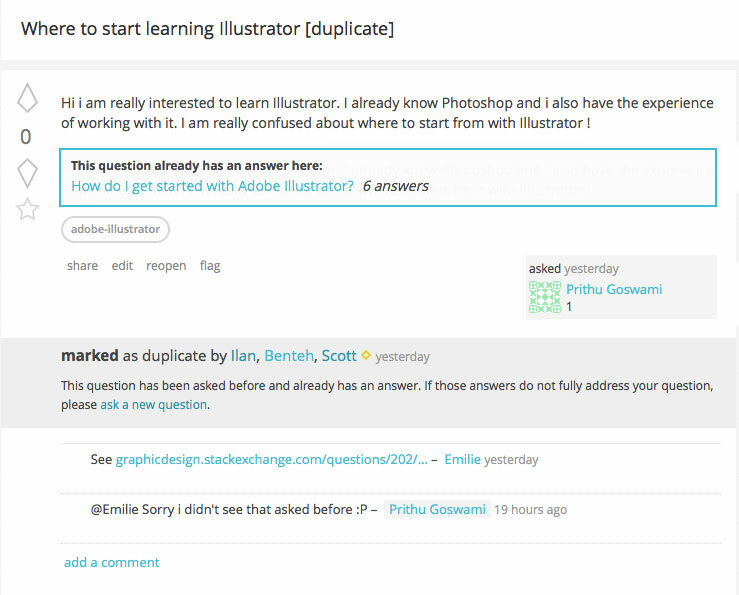 I think that the "has an answer" text of the duplicate section should either be linked to the duplicate answer. Or, if that's untenable, clicking the "has an answer" text could cause the browser to scroll up to the "This question already has an answer here" box and highlight it or something like that. Banner blindness is a real thing, and so some people might miss the block up top. It's not intuitive to tell someone there's a link but have that link be somewhere else. Even if I know that I would need to scroll up from the "marked as duplicate" section to get to the duplicate link, that's just not good UX. No real change in front end design other than wrapping three words with an anchor. Unless this would be a huge pain to implement on the back end, it's a minimal change with a big upside. I think this is a problem as well. First, no one reads the answer before they read a question. So placement before the question text is counter intuitive. It asks users to back up, rewind,and look before the question for an answer. The example used in this thread/question/answer is a simple one - easily viewable "above the fold" as it were. However, imagine a longer question which a user scrolls to read.... they get to the bottom, see it's marked as a duplicate.... then have no clue where the duplicate may be. While not expressed in the best of ways, we had a user post a comment on meta.graphicdesign.stackexchange.com who was clearly frustrated by this very thing. I can imagine for the reason I've posted above. Second, The placement of the duplicate link is positioned, and often colored, in a manner which promotes user blindness. I've found this true across all SE sites. It's visually a banner, and as such easily falls into the "content blindness" experience many users get while viewing any site. Combine #1 and #2 above and it's completely disregarded by many new users more than it's noticed. Sure, those who have experience with SE sites are used to it and know it's there and overcome the "banner blindness" consciously when we need to. But that does not help new users. The link should be moved, in my opinion, and be made visually more prominent. After the question text, within the actual question, would be one of the optimum positions in my opinion. This would clearly allow the message and link to be seen after a user has read the question, which is when they are seeking the answer. Even moving it below the tags, and above the "marked as" message would be better - provided it is visually different than the "marked as" message below it. It would be more intuitive if the duplicate would be listed in the lower banner. I have prepared the following image showing where it would be, in my mind, the most intuitive. Now the sentence is complete in one place and it's still visible. Obviously I didn't spend very long thinking of the idea so the real, or best, design might differ. The problem that has been solved is that it is no longer confusing having the data in 2 places at the same time. However, the closers could be possibly be less prominent. The [duplicate] itself should probably also be a link. 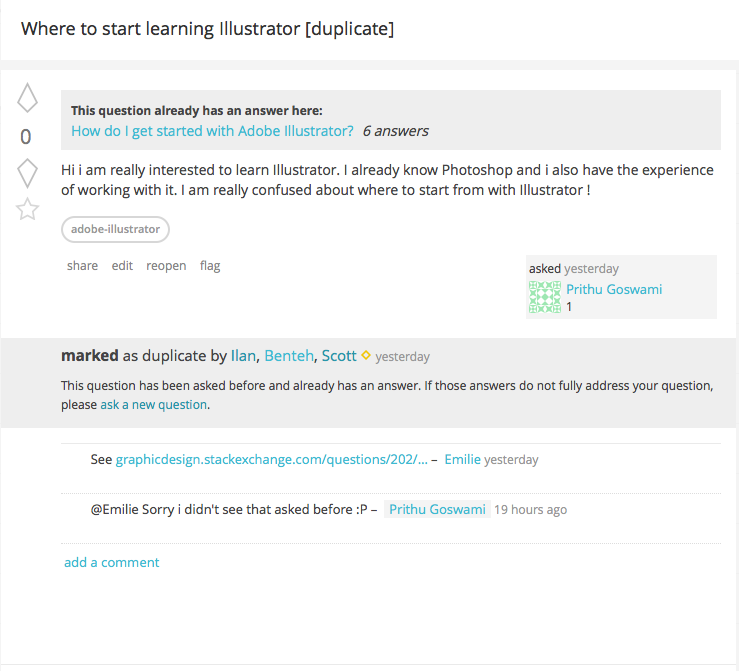 The text in the duplicate box instructing you to ask a new question should be different. It should instead say 'ask a new question that clearly clarifies how it's different' or something similar, with links to FAQ or instructions about research. For me, the word Duplicate itself should be the link itself to the question and the has an answer part should be linked to the accepted answer or the top answer of the original question to avoid confusion. That is just for better UX and user experience. This question was marked as an exact duplicate of an existing question. If this question is different, please edit it to explain how it is different or ask a new question. if necessary. I support everything made before this edit and I do understand if adding the link in three different places might be too much. But I think the third link to the duplicate should help. Not the answer you're looking for? Browse other questions tagged feature-request vote-to-close duplicate-questions . When I flag as dupe, can the system put the link to the answer and not the question? Why are there two separate boxes about duplicate questions? Why do some duplicate questions not refer to the original question? Does the change in “Exact Duplicate” wording imply a shift in policy? Should the “closed as duplicate” message be altered?